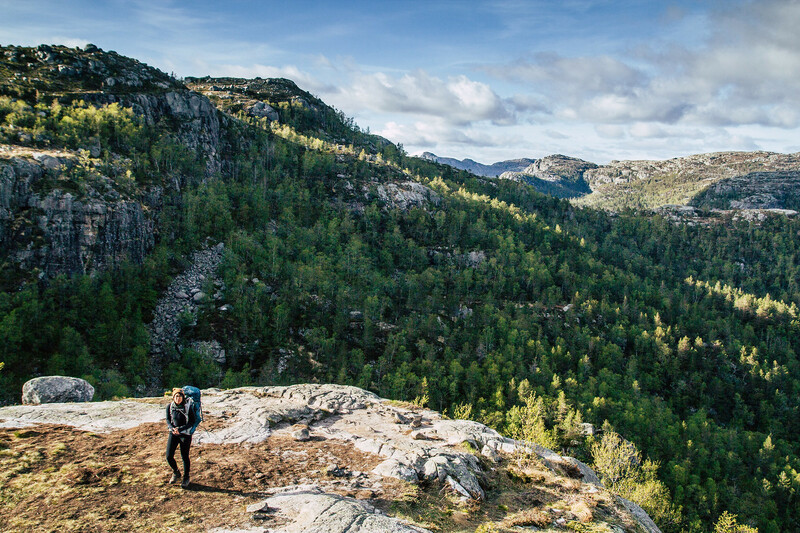 After spending a few days in Bergen and hiking the Vidden trail, we continued our journey further South to Stavanger to meet up with a new friend, Matthias (www.snapshopped.com) - a young, lovely and talented photographer who we've gotten to know through social media. It has been more than a year since our paths crossed each other online and from the very beginning we were quickly inspired by Matthias' photography. What really stroke us, however, was the positive and sincere words, he always left on our blog. It wasn’t long before we knew, that somehow and somewhere we had to make a real-life connection with him. Luckily, life granted us the opportunity this year. With Matthias moving to Stavanger in Norway in May, setting feet into Scandinavian territory, we didn't hesitate for one second and soon we were on our way up north. With Stavanger being the gateway to one of the most iconic landmarks of Norway, Preikestolen (The Pulpit Rock)) - a mountain plateau that hangs an impressive 604 meters above sea level and the Lysefjord - it was a no-brainer that we simply had to go there while visiting Matthias. He happily arranged the trip and together we decided to stay a night on the mountain in hopes to catch both the sunset and sunrise on Preikestolen. What you won't do for those pictures, right? :) We left Stavanger in the afternoon, first taking the ferry from Stavanger to Tau and then a bus to Preikestolen Mountain Lodge. This place serves as the starting point for the 3.8 km hike to Preikestolen; with the hike normally taking less than two hours to complete (one-way). The climb to Preikestolen is one of the more easier hikes we have done. This worked out great to our favor as we were a little pressured with time when ascending the mountain. Crowds of people were making their way down as we were heading up. You could see on some of their faces that they were struggling - some even in pain. A quick look at the choice of footwear explained why. They did not wear proper hiking shoes, which is necessary on this hike unless you desire a pair of burning feet afterwards. Despite being a relatively easy hike, the path is still very steep in places and can be a little challenging as you are climbing rocks of all shapes and sizes. So really do yourself a favor when you go here, bring a pair of good hiking shoes or boots. One hour and something later, we reached the Preikestolen plateau right before the Golden hour and were met by the most incredible light casting its rays over the deep blue waters of Lysefjord and the surrounding mountainscape. There were nothing more than a handful of people around to share this moment with us. Standing there in solitude with only the gentle gushing sound of a water vibrating through the air was definitely one for the books. Preikestolen has been a dream destination of ours since we started The Nordic Journey and to finally find ourselves standing at the very edge of the cliff was unbelievable and a little terrifying! Stepping close to the plateau edge and actually seeing its vertical drop to the fjord was crazy. It's a sight that will make your heart race. Had there been more days, we would totally have marched along the fjord, examining every little mountain top on our way. For now, however, we settled down at one of the rock formations overlooking Preikestolen itself and watched how day turned into night and into day once again. Unfortunately, the morning did not bless us with the same incredible light as the day before. As we crawled out of the tent, the only thing that met our eyes was the sun tugged away behind a dense carpet of clouds. With everything being mostly dark and grey, we agreed to slowly pack things up so we could descend the mountain, beating the crowds of people on our way down. As we took in the last views of the amazing scenery, a stroke of luck hit us as we least expected it. The morning sun broke through the clouds and cast its rays across Lysefjord and on to the cliff. It was an electric moment! A rewarding one for us three early birds, who had been up since 5AM. Preikestolen (The Pulpit Rock) is a square formation of rock resembling a pulpit, standing 604 meters above the Lysefjord. It is one of the most iconic Norwegian landmarks and is found in the municipality of Forsand in Rogaland county, Norway. The Preikestolen Mountain Lodge serves as the starting point for the 3.8 km hike to Preikestolen and the hike itself normally taking less than two hours to complete (one-way). Det kan simpelthen ikke være rigtigt, at vi endnu ikke har besøgt Norge. Nøj, hvor ser det lækkert ud! I øvrigt godt tip med at vælge det rigtige fodtøj ;) Har selv haft et par ture, hvor jeg har valgt de forkerte sko eller støvler, og det kan altså virkelig ødelægge humøret og oplevelsen. Hvor ser det bare helt fantastisk ud! Jeres billeder er simpelthen så smukke. Foruden Svalbard, har jeg været i Tromsø, Lofoten og Narvik. Og Bergen, da jeg var helt lille, så det kan jeg ikke huske meget af ;) Lofoten var klart mit yndlingssted, så det kan jeg kun anbefale!! The hike it selv was for me not the most spectacular, but the final destination - wow, simply wow! 😍 I think we were extremely lucky with the crowd - we were there just before the season started, so that probably made the difference. And yeah!! Meeting Matthias was the best. It so much fun to meet people you connect with online. Hope there will be many more experiences like this in the future. Incredible. I need to make my way here someday. Yes Mina, Scandinavia is calling your name. Det ser SÅ fedt ud! Og så tager I altså nogle vildt fede billeder! Næste år skal vi roadtrippe hele vejen op igennem Norge med begge hunde og det her sted SKAL besøges. Håber hundene kan være med på sådan en hike på trods af sten (ellers må jeg træne arm-mullerne inden, så de kan bæres). Thumbs up til jeres blog! Følger med i alle nye indlæg :-) Jeres nuværende Tysklands eventyr ser også meget inspirerende ud!